Many of our clients organized paper shredding events last week in honor of Earth Day, April 22nd. #EarthDay is a global holiday where people join efforts to show support for a sustainable environmentâ€”like hold a shred day. Paper shredding is an eco-friendly way to remove unwanted paper securely while protecting our planet. Many businesses found creative ways to make paper shredding available for their customers and even the community to build good will, raise awareness, and keep secure documents out of prying eyes. Even if you missed this opportunity to hold a shred day on Earth Day, you donâ€™t have to wait until next year to do this. Because every day is Earth Day! Take a note from two of Corodataâ€™s member-based clients. Both organizations hold a shred day annually and invite members to correctly shred confidential documents. Members can take advantage of the event to securely shred confidential records, personal or otherwise. Itâ€™s a valued service provided for members, and itâ€™s fun: Usually, the events offer food and the day turns into a memorable group activity. Spread good will in the community along with shredding documents. In addition to inviting customers and residents to come out for a day of document destruction, you can team up with a worthy organization and raise some money for a charity, ask for food bank donations, or hold pet adoptions through a local shelter. As part of their waste management and recycling efforts, city governments in the San Francisco Bay Area offer free annual shred days to raise awareness of identity theft prevention, along with the importance of recycling. These popular events require proof of residency in one of the nearby cities and a maximum number of boxes per person. Boxes of documents where your name, address, and social security number appear are deposited into shred bins and destroyed onsite. These are highly attended events where neighbors can get to know each other, and take care of some secure spring cleaning. 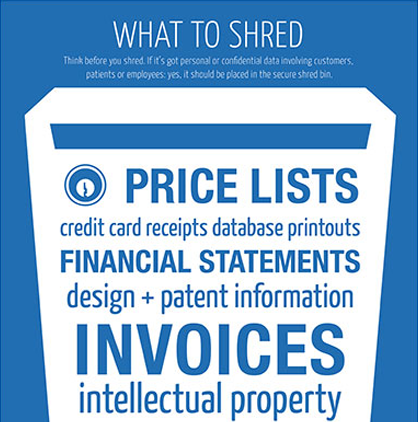 Banks and credit unions across the country offer shredding days to encourage customers to destroy bank records with sensitive information like bank account and credit card numbers and your name and address in a secure way. This helps raise awareness about the dangers of identity theft. Plus, destroying these documents on a regular basis instead of throwing them out helps minimize risk for both the bank and the customer, a real win-win. The earth wins too: Youâ€™ll be recycling all that unwanted paper waste. Open up the shred day to the community to spread good will and meet potential new clients. If youâ€™re one of many companies with a green initiative to recycle a certain amount of paper each year, then youâ€™re in luck. Holding a shred day helps meet the annual goal. Shredded material can be re-used in other products if it’s properly recycled. Plan to collect as much paper in-office, and invite your customers to join you in your shred day. Add music and munchies, and everyone will have fun.